One of the most beautiful cities we have visited is Siena when we were in Italy in 2010. Dave and I left Assisi and took a drive to Firenze (Florence). When we were on honeymoon, we missed out on two things in Florence and had driven back to walk around the Duomo and visit the Uffizzi Gallery. We then drove to Sienna where we stayed at the Hotel il Palio in the old city. We found a quaint restaurant just outside the old walls called Ristorante Imaestri where we had a very memorable meal. Panforte is said to have originated in Siena and the traditional recipe should contain 17 ingredients, which represent the number of Contrade within the city walls. My recipe is based on one I cut out of the Fair Lady magazine and does not contain that many ingredients. The recipe also called for rice paper and after making mine with rice paper, I cannot see the need for it. I have since checked up on traditional recipes, and they do not call for rice paper. It is only commercial panforte that uses rice paper. This panforte is rich and decadent and a small slim slice is all you need. Serve it with an espresso or dessert wine and you will be transported in taste sensation at least to Siena. Traditionally panforte is dusted with icing sugar. Yum, I love panforte! The thing is one slice is never enough for me, and so I tend to finish it too quickly and last time I bought some, I had a major sugar rush! Will have to try your recipe with fructose! 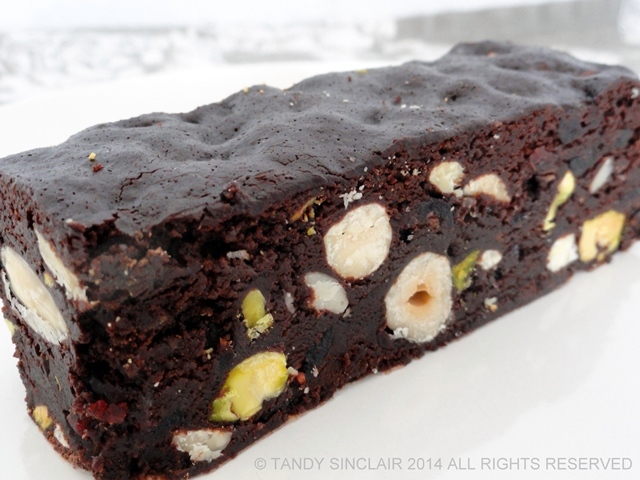 Nice photos of the panforte!This looks absolutely delicious ! Wow…17 ingredients in the original recipe is quite a lot! 🙂 I’ve never had panforte before, but yours looks so tasty I really want to try it now! Oh this looks beautiful! Would make such a lovely gift too. Looks AMAZING!!! I have never made panforte so… I better try after seeing this! Oooh I wish I could go to Italy and sit in a cafe and try all the great food! Glad to know I can have a slice of Italy with this panforte 🙂 Thanks for sharing! I love panforte and often make it as Christmas presents for family and friends. What a lovely gift to make and receive! Have never had chocolate panforte but as my family as huge fans of panforte at Christmas I think I need to give this a go! This is something I was wanting to make a while ago and I have since forgotten all about it. So … thanks for the reminder! It sounds so beautifully rich and chocolaty! Hi Tandy, sounds like you had a wonderful trip. This looks delicious! Pinned! Thanks for the visit Tom, I hope Laura will make this for you! Never made the Panforte. Thanks for a beautiful recipe and ….your story!